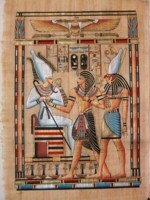 It is known that the ancient Egyptians played a form of bowls more than 5000 years ago. Sir Flinders Petrie, a British Egyptologist, reported that during his excavations he found in the grave of a young Egyptian boy, various rounded objects which led him to believe that they were used for playing with by rolling them along the ground.From Egypt it spread to Greece and Rome; where the Romans played "Bocci", and that word is still used in Italy today. We can doubtless thank them for introducing the game to England.Roman legions introduced the game to countries throughout the empire. Over time, the stones were replaced by balls that were usually rolled, rather than thrown. In France, the sport became known as boules, from the Latin word for ball, and the English world "bowl" came from that French root. It was in the thirteenth century that the game as it is played today became popular. It is generally accepted that earlier versions of the game were centred around hitting the target, as opposed to getting the bowl as close as possible to it.There is a positive recorded history of bowls having been played in England as far back as the 12th century, and it could well have been played much earlier than that. 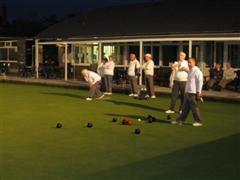 It is primarily an English game, and the Southampton Bowls Club is reputed to be the oldest in the world, its lawn having been laid in 1187. The green was in regular use by 1299 and the club has a tournament every year to mark that history. The Chesterfield Bowling Club claims to have a rink dating back to 1294.The two oldest British sports are archery and bowls, and in centuries past there was conflict between the two, mainly during periods of warfare or national strife. In the early fourteenth century, King Edward III banned the playing of bowls, along with other sports. Why? Because he wanted the archers of Britain to get practice with no other sporting distractions. This was because of the wars in Europe at the time and King Edward was afraid that the practice of archery was being neglected. 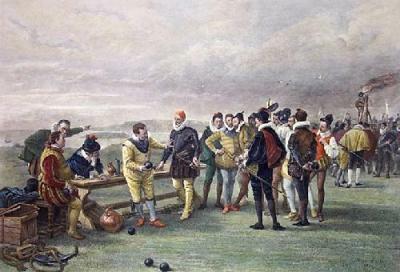 Henry VIII, himself a bowler, in 1511 banned the sport among the lower classes and levied a fee of 100 pounds on any private bowling green to ensure that only the wealthy could play. The main reason for the ban, as for similar bans on other sports, was that able-bodied men were supposed to spend their spare time practicing archery. The king's proclamation also noted that arrow-makers and bow-makers weren't being productive enough because of the time they wasted on bowling. On 19th July 1588 Captain Thomas Fleming in the Golden Hinde, glimpsed the Armada through the swirling morning mist off the Lizard and raced for Plymouth, Lord Howard’s home port. Fleming came up the channel into Plymouth with the afternoon tide to find Sir Francis Drake playing bowls with his officers on the Ho, high above the harbour. On hearing of Fleming’s sighting Drake insisted on continuing with the game. Drake playing bowls on Plymouth Ho as the arrival of the Spanish Armada in the Channel is announced . Such bans soon passed with the use of firearms and the declining importance of archery in warfare, but the Puritan revolution virtually ended all sports in England, and lawn bowling didn't make much of a comeback even with the Restoration of 1660. From the early 15th century bowls were made of wood, usually yew, ash, oak, holly, or boxwood.Lignum vitae was not used in the United Kingdom until the 16th or 17th century; this very hard wood was discovered by Christopher Columbus in the West Indies, in 1493. Lignum vitae wood is so heavy that it will sink in water.The bowls used in the early days were merely rounded, without bias. The bias was not introduced until 1522 due entirely (it is claimed), to the accidental breaking of a bowl by Charles Brandon, Duke of Suffolk; he rushed indoors and sawed off an ornamental ball from a banister. Accordingly, one part was flat and it took a curving direction at the end of its run, instead of continuing on a straight line.The first clear set of the rules of bowls were drawn up by none other than King Charles II in 1670. The game also became very popular in Scotland and in the mid-nineteenth century a committee was set up to draw up a code of laws.A Glasgow solicitor named W.W. Mitchell drew up the rules, and they have remained almost the same since then.The Scots were responsible for developing flat greens, and also for taking the game abroad. The Scottish Bowling Association (SBA) was formed in 1892, and the English Bowling Association (EBA) was formed in 1903 with test cricketer W.G. Grace, as its president.The first Scottish Championships were first held in 1894, and the English Championships were first held in 1905. In July 1905 a governing body was formed to oversee the game, as by then it was becoming played in different countries. The International Bowling Board (IBB) was formed in Cardiff, Wales. 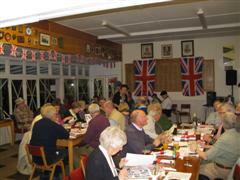 It replaced the Imperial Bowling Association which arranged matches within Commonwealth countries. The IBB is now called the World Bowls Board.In 1930, bowls made its debut at the Commonwealth Games, at Hamilton, Canada. It has been included in every Games since, except in 1966 when the first World Championships were held. The English Bowling Federation (EBF) was formed in 1945 because there were some counties in England, mainly in the Midlands and the North, who did not agree with the rules. Bowls are designed to travel a curved path, referred to as bias , and was originally produced by inserting weights to one side of the bowl. This is no longer permitted by the rules and bias is now produced entirely by the shape of the bowl. A bowler can recognise the bias direction of the bowl in his hand by a dimple or symbol on one side. Regulations determine minimum and maximum curvature characteristics allowed, but within these rules bowlers can and do choose bowls to suit their own preference. They were originally made from lignum vitae , a dense wood giving rise to the term "woods" for bowls, but are now more typically made of a hard plastic composite material. Usually coloured black, bowls are now available in a variety of colours including a range of fluorescent colours. They have unique symbol markings to identify competitors' bowls, and by regulation have a diameter of about 15 centimetres. When bowling there are several types of delivery. "Draw" shots are those where the bowl is rolled to a specific location without causing too much disturbance of bowls already in the head. For a right-handed bowler, "forehand draw" is initially aimed to the right of the jack, and curves in to the left. The same bowler can deliver a "backhand draw" by turning the bowl over in his hand and curving it the opposite way, from left to right. In both cases, the bowl is rolled as close to the jack as possible, unless tactics demand otherwise. A "drive" involves bowling with considerable force with the aim of knocking either the jack or a specific bowl out of play - and with the drive's speed, there is virtually no noticeable curve on the shot. An "upshot" or "yard on" shot involves delivering the bowl with an extra degree of weight, enough to displace the jack or disturb other bowls in the head without killing the end. The challenge in all these shots is to be able to adjust line and length accordingly, the faster the delivery, the narrower the line or "grass".